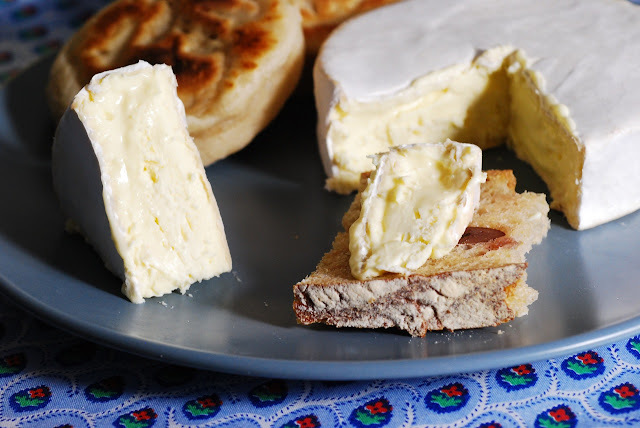 Brie, alpine cheese, and fresh breads: simple pleasures. The enjoyment of these things is heightened when you make them yourself. 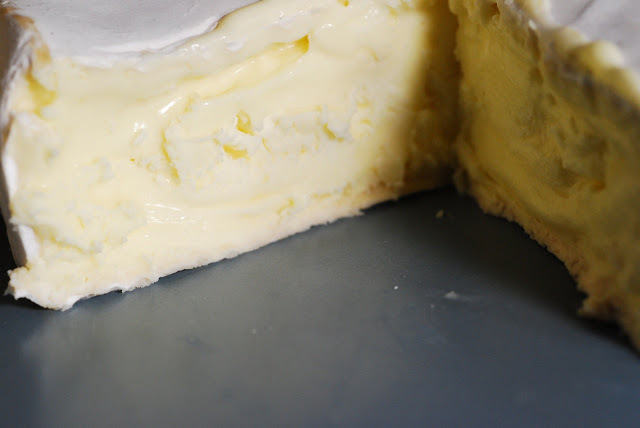 Do you recognize this brie? Some of the problems of the world eventually make their way to Vermont; not many, but some. 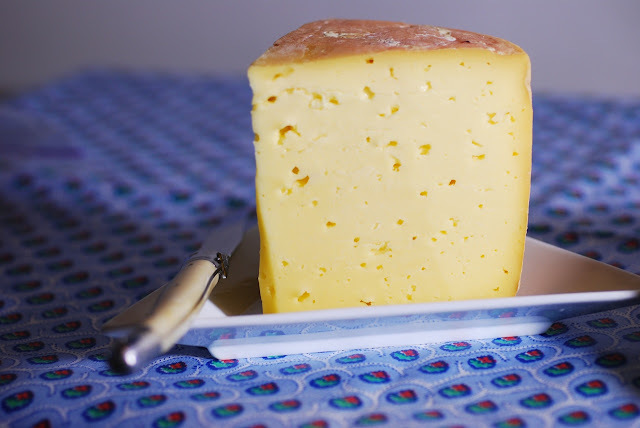 When things are tough, and you don't feel like cooking, it's so great to have cheese. So comforting. whole wheat flour. I've been using this flour for a couple of years, and think it's a wonderful alternative to regular whole wheat in breads. Mix 1 cup sourdough starter and 1 cup all-purpose flour. If this is too dry to mix, add a bit of water. It should be quite firm. Place in covered bowl. Leave this for about 4 to 6 hours before use. The dough temperature should be in the mid-70s (F). 1. Mix the flour and water together briefly (the autolyze) and leave for 30 minutes. 2. Add the levain and salt, mix in machine with dough hook until moderately developed. The dough should be supple but sturdy. 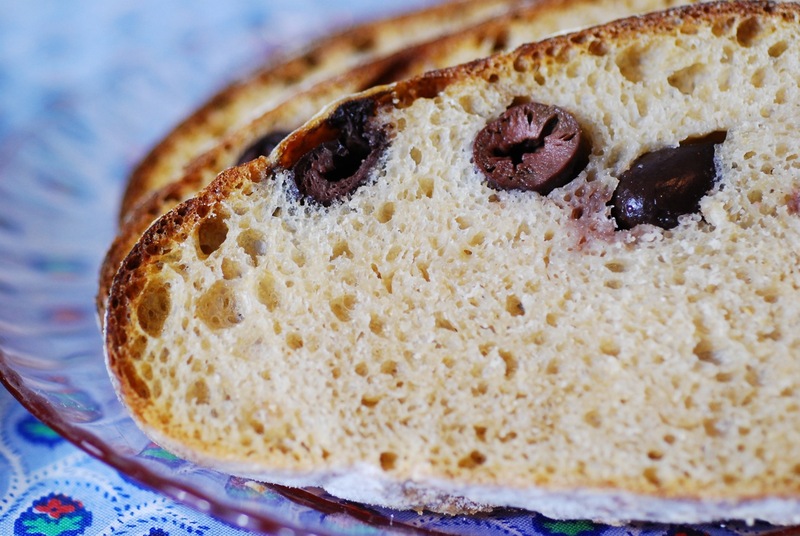 Do not overmix, which will damage the dough. Test the dough with the windowpane test. 3. Let rise at 76 - 78F for 2.5 hours. During this period, fold twice at 45-minute intervals. Folding means to take the dough out of the bowl, onto a lightly floured counter, stretch it to one side, fold toward the center. Then stretch the other side and fold it toward the center, Do the same with the top and bottom sides. Put it back into the bowl. On the final fold, fold in the olives, ensuring they are evenly distributed in the dough. 4. Divide the dough into desired sizes (4 lb for a large miche, 1.5 lbs for a smaller boule) and pre-shape into a ball. Wait 30 minutes, then give the final shaping. 5. Place in heavily-floured proofing basket or floured linen-lined bowl for 2 - 2.5 hours. Turn on the oven an hour before you are ready to bake, so that the stone has time to get hot. 6. Invert the basket onto a floured peel. Slash the top of the loaf if you desire, with the lame. 7. Bake 45 minutes at 460F with steam at the start (throw in a half cup water right after loading the oven). 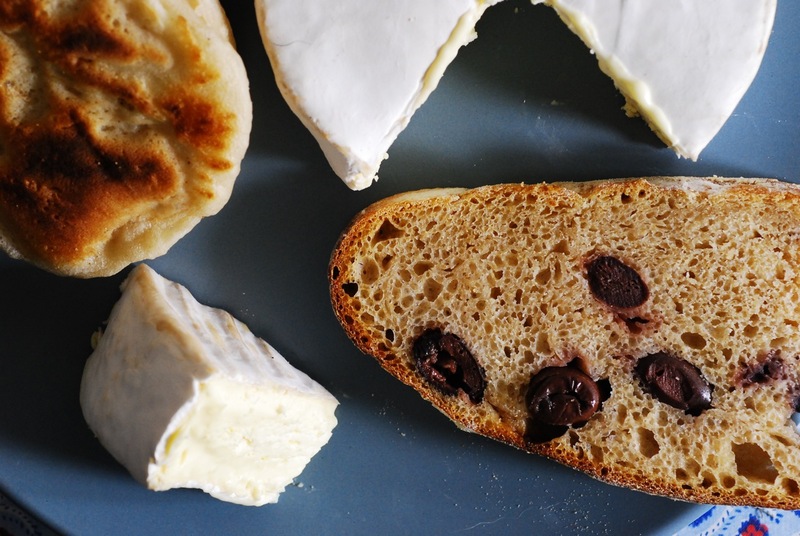 The flavor of this bread really goes well with the buttery brie. Surprising, because a baguette would be more conventional. 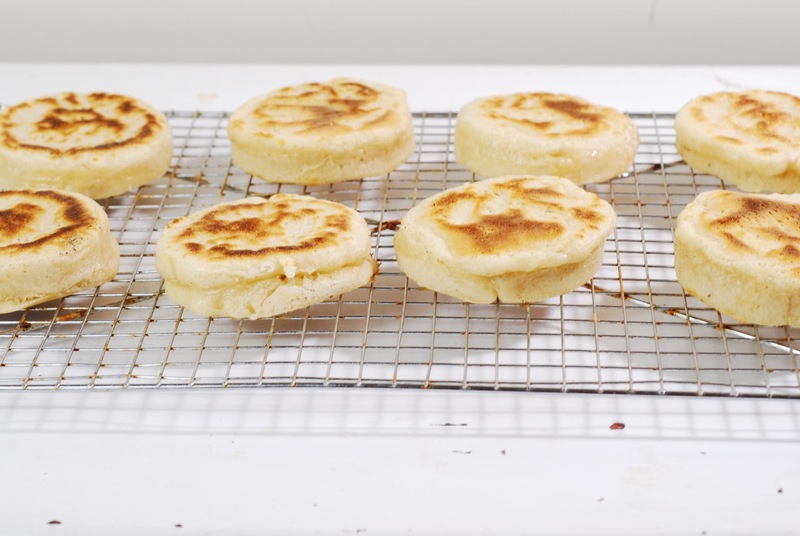 Another nice thing to put out is English Muffins. 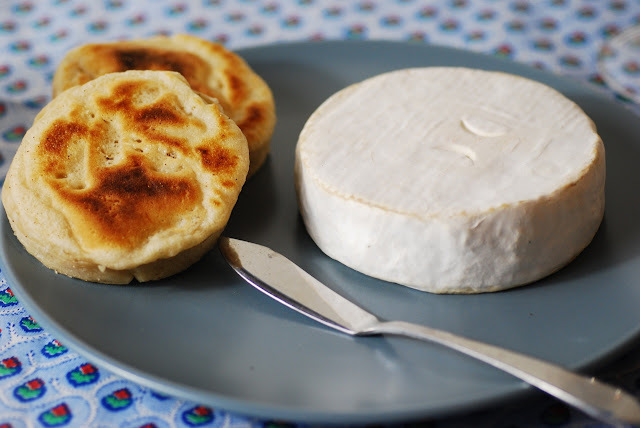 I like to use sourdough starter as a partial shortcut for making these. The important thing to keep in mind is that they should be made with a very active, very slack dough, cooked in muffin rings on a griddle. No rolling, baking, etc. After a half hour, combine Dough 1 and Dough 2. Add 1 tsp salt and 1/2 tsp baking soda. Mix in well. If dough is too soft, add a bit more flour. 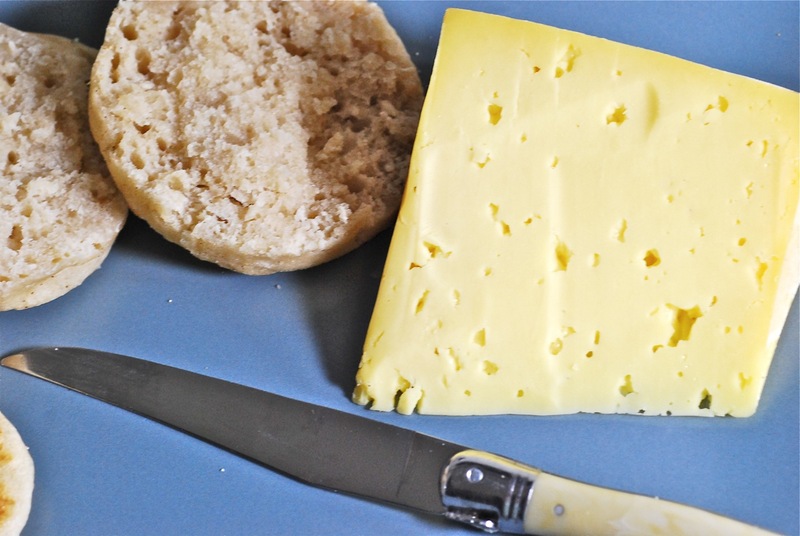 The desired texture is thick, spoonable dough. Cover and allow to rise for 1 hour or until doubled. Do NOT punch down. Heat a flat griddle on medium heat. Using english muffin rings, or other circular metal rings, place on the griddgle and then spray the inside of the ring with cooking spray. Carefully remove a heaping serving spoonful of dough from the bowl and put into the ring, which will start to expand immediately, rising and filling the ring. When bubbles form on the top, lift the muffin with a spatula and flip; then immediately remove the ring. The muffin will slump slightly, which is desired. Continue cooking until firm to the touch and baked through; remove to cooling rack. Nooks - Check. Crannies - Check. Today I made Engllish Muffins using whey and buttermilk instead of sourdough. They were delicious. No rings needed. Cook 3-5 minutes on each side on a cast iton griddle, then 8-10 in the oven on a hot cookie sheet. 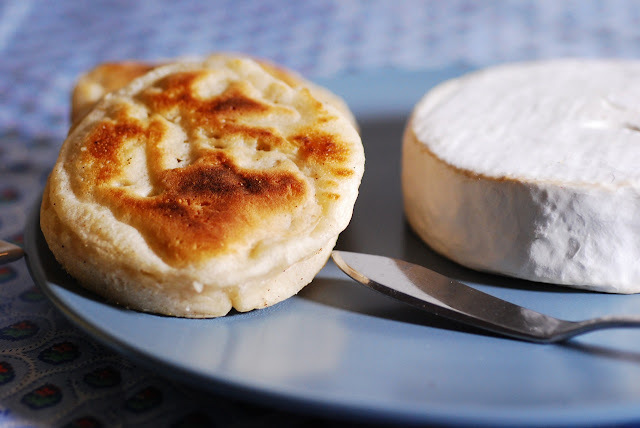 I would love to know how you make the brie at home.